I realise there’s been a rather manic, end-of-month flurry of activity on the blog but here’s another last minute recipe, which I just had to squeeze in just in time to make the deadline for this month’s Spice Trail challenge. The theme for March has been ginger and I’ve received a brilliant selection of ginger goodies; the round-up promises to be a real treat. 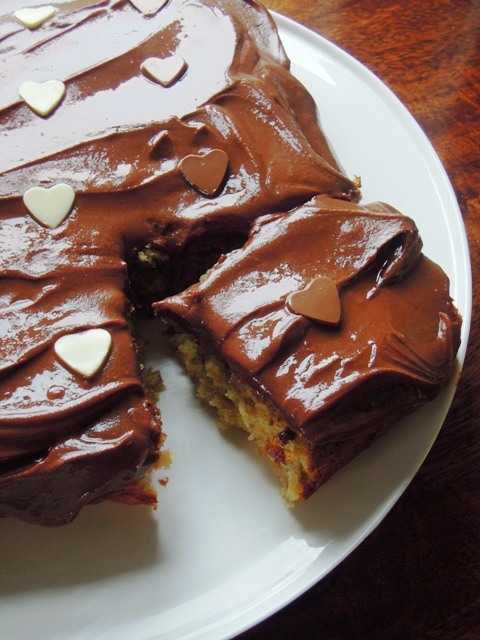 This last entry from me is a very easy-to-make banana sponge, featuring delightful chunks of chewy, crystallised ginger and dark chocolate chips, lavishly topped with a gorgeously decadent chocolate buttercream. It’s certainly not one for the weight-watchers I’m afraid, but my family made light work of getting through it, and as the cake does contain three bananas there is a little goodness in there as well as the naughty stuff. Life is all about balance, after all. I also used Dr Oetker chocolate hearts to decorate. 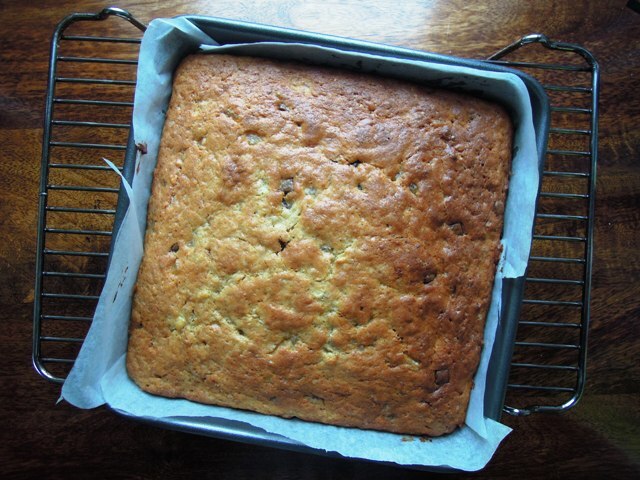 Butter and line a 20cm square cake tin with baking parchment. Sift the flour, baking powder, salt and ground ginger into a large bowl. In a separate bowl, cream together the butter and sugar until light and fluffy. Mix in the eggs, vanilla and milk. Fold the wet mixture into the dry mixture, and then fold in the mashed banana, chocolate chips and crystallised ginger. Pour the cake batter into the tin and bake for 35 to 40 minutes until golden and a skewer inserted into the middle comes out clean. Leave to cool for a few minutes before turning the cake out onto a wire rack to cool completely. To make the chocolate buttercream, melt the chocolate in a microwave on a low setting or in a bowl over a pan of just-simmering water. Leave to cool a little. Beat the butter in another bowl until pale, and then beat in the icing sugar and vanilla. Add the chocolate and mix well. Spread the chocolate buttercream generously over the cake and, if you like, decorate with chocolate hearts or something similar. Oh divine! Completely divine! Love this mingling of delicious flavor. On my list to make next week! Just wanted to say that I made this cake today for my daughter’s 10th birthday and it went down very well! Thrilled I found The Spice Trail and discovered it!! Hi Sarah! So pleased the cake was well received – hope your daughter had a wonderful 10th birthday. Did she have a party to celebrate? Her party is on Saturday so it was a family celebration last night! I have enough cake left over to hand out after tennis this afternoon so perfect! That glistening icing makes this cake look unbelievably tempting, just delicious! 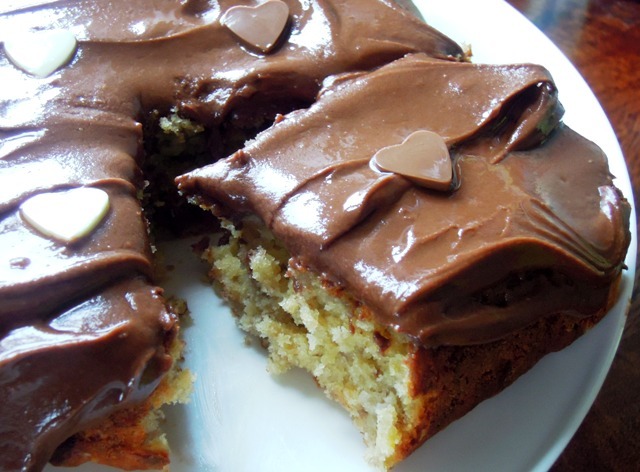 Thanks Anna – yes, that chocolate icing is just as naughty as it looks!